July 16, 2013 (Washington D.C.) — A survey of teachers who instruct American middle and high school students finds that digital technologies are impacting student writing in myriad ways and there are significant advantages from tech-based learning. According to teachers, students’ exposure to a broader audience for their work and more feedback from peers encourages greater student investment in what they write and in the writing process as a whole. These findings emerge from an online survey conducted by the Pew Research Center’s Internet & American Life Project in collaboration with the College Board and the National Writing Project. It is a non-probability sample of 2,462 middle and high school teachers currently teaching in the U.S. and its territories, conducted between March 7 and April 23, 2012. Some 1,750 of the teachers are drawn from a sample of advanced placement (AP) high school teachers, while the remaining 712 are from a sample of National Writing Project teachers. Reflecting these latter concerns, a majority of these teachers spend class time “discussing with students the concepts of citation and plagiarism” (88%) and “discussing with students the concepts of fair use and copyright” (75%). 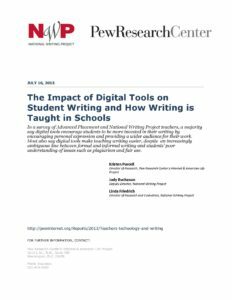 While the survey includes teachers of all subjects, English/Language Arts teachers in the sample consistently express more positive views of the impact of digital tools on student writing and the potential of these tools to help them teach writing. Almost two-thirds (64%) of English/Language Arts teachers surveyed say digital tools make teaching writing easier, compared with 32% of Math teachers, 38% of Science teachers, and 45% of History/Social Studies teachers. English teachers are the most likely to use collaborative online platforms with their students, and are more likely than teachers of other subjects to say digital tools increase the likelihood students will revise and edit their work. They are the least likely of all teachers to say digital tools make students careless in their writing or undermine grammatical and spelling skills. Overall, how would you rate your students in their ability to do each of the following? Source: The Pew Research Center’s Internet & American Life Project Online Survey of Teachers, March 7 to April 23, 2012. Based on a non-representative sample of 2,067 middle and high school teachers.